SAN JOSE — A new hotel has been proposed for downtown San Jose’ s bustling SoFA district, the latest indicator that a widening group of investors want to launch projects in the city’s urban core. The hotel, planned for the corner of South Second and East Reed streets in San Jose, would rise seven stories and contain 109 rooms, according to documents on file with city planners. The increasingly vibrant residential, restaurant, entertainment and nightlife scene in downtown San Jose is on the minds of the new hotel’s developers, according to Jim Heilbronner, founder and president of Oakland-based Architectural Dimensions, which is designing the hotel at 605 South Second Street. The future lodging place, smaller than some of the big hotels that are operating downtown, could fill a niche of inns with a cozy size that would complement the larger establishments. “In any growing downtown, along with the major hotels, you have smaller ones that might have a lower price,” said Mark Ritchie, president of realty brokerage Ritchie Commercial. This hotel is being planned in San Jose’s SoFA — South First Area — district. Restaurants, night spots, live theater and entertainment outlets have sprouted in the neighborhood, along with arts-related ventures. The new hotel also would be a few blocks from San Jose’s convention center. Three residential towers, a theater, and retail and dining space could rise on a site that would be a future gateway to the downtown. This project is planned for a block from the hotel site. Also a block away, a 27-story residential tower is being planned, a development that could be the tallest building in San Jose. “There is a lot of development going on and being planned, you can really see this is a neighborhood that’s changing,” Heilbronner said. Already under construction are the Sparq apartments, a 105-unit residential complex with ground-floor retail, just down the street at South First and East Reed streets. Adding to the neighborhood’s rising activity is The Pierce, a new 230-unit residential development where tenants are now living. 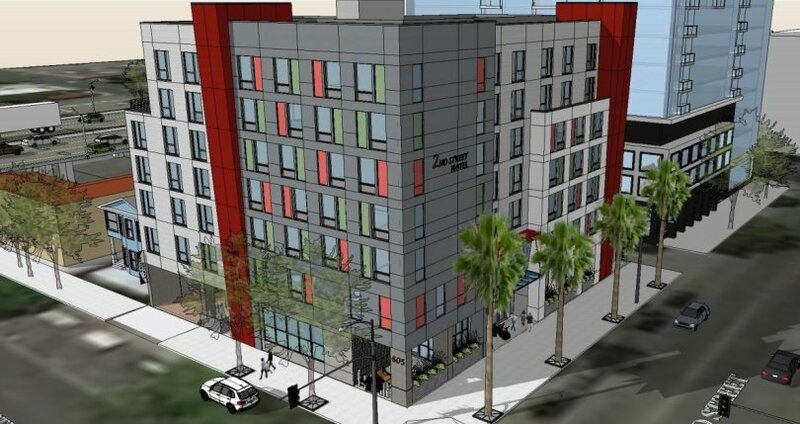 Plans for the new hotel at 605 S. Second St. have emerged at a time when the lodging market has become robust in Silicon Valley and other parts of the Bay Area. “There is an explosion of hospitality growth throughout the Bay Area,” Heilbronner said. During the first four months of 2018 compared to the similar period of 2017, average revenue per available room rose 5.4 percent in Northern California and by 7.7 percent in the Santa Clara County and Peninsula areas, excluding the San Francisco airport area, according to a July 3 report released by CBRE Hotels. Adding to the optimism are plans such as Google’s proposed transit-oriented community of offices, residences, shops, restaurants and open spaces near the Diridon train station, a development where 15,000 to 20,000 of the search giant’s employees would eventually work. San Jose-based Adobe Systems intends to build a new office tower next to its existing three-building downtown headquarters campus, marking a big expansion fueled by major employee growth. “The volume of downtown San Jose is filling up as it becomes more urbanized,” Heilbronner said.